Tag Archives for " free eBook "
If you’ve read this blog, or anything I’ve written for that matter, then you know I’m a strategy before tactics kind of guy, but sometimes you just need some new ideas and tactics. I got together with my network of independent Duct Tape Marketing Consultants and brainstormed fifty tactics for generating more leads. Each of these tactics came from the work we’ve done with a client or something brilliant we’ve witnessed a company doing. I’ve compiled the list into a free ebook. Each tactic lists the type of business that employed it as well as a concise example of how they put the tactic to work. In addition you’ll find the contact information for the contributor of each tactic in case you want to know more about how to integrate the idea into your marketing. This is an easy way to get eight or ten new ideas on how to get your business in front of more of the right people right away. As a side note this is also a great way to employ collaboration to create useful content. 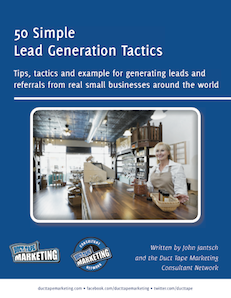 You can download 50 Simple Lead Generation Tactics here.